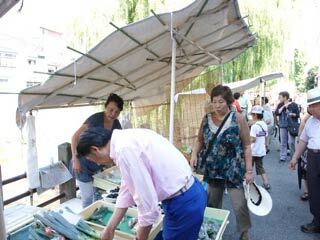 Miyagawa Morning Market (宮川朝市) happens every morning at Takayama. There are many shops which sales fresh vegetables, local craft works, gifts, and local food such as Miso, and most of them have very reasonable price. The milk of the fish markets is one of the best milk you can get around here. Before you visit the Takayama Historic District, check out the morning market for more interesting food and gifts. The history of the market began since Edo Period. You can enjoy shopping and taking and dealing with "Kakasa," means the wife of farmers in Hida dialect, is very fun.